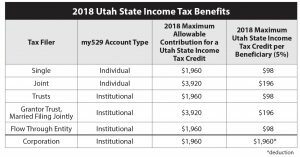 (Salt Lake City) Utah taxpayers can save on their 2018 taxes when they invest for college with my529, Utah’s official nonprofit 529 educational savings plan. 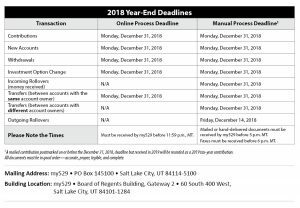 my529 account owners can claim a 5 percent Utah state income tax credit or deduction for 2018 tax year contributions for each qualified beneficiary. Contributions are eligible for tax benefits up to the allowed maximum (see table below). For the account owner to qualify for state tax benefits, the beneficiary must be younger than 19 when he or she was designated on the account. Account owners with more than one beneficiary can total the credits for each beneficiary. For example, if a Utah account owner files “single” on their Utah state income taxes, and contributes $1,960 to a my529 account for each of three beneficiaries, they can claim the 5 percent tax credit of $98 for all three beneficiaries, for a total tax savings of $294. A corporation may deduct up to $1,960 per beneficiary from its income. In addition, if a friend or family member contributes to an account, the account owner can include that contribution in their total tax credit. Friends or family can easily make contributions through the my529 Gift Program. In addition to the Utah state income tax credit, earnings on my529 accounts grow tax-deferred. Withdrawals are free from federal and Utah state income taxes when used for qualified higher education expenses. Qualified expenses include tuition and fees; required books, supplies, and equipment; computers, related equipment, services, and internet access; and certain room and board costs. You can use funds at technical schools, colleges, and universities in the United States and abroad that participate in federal financial aid programs for students. In addition, you can use my529 funds for K-12 tuition expenses of up to $10,000 per beneficiary per year (from all qualified tuition programs) at public, private, and religious schools. my529, formerly named the Utah Educational Savings Plan, is highly ranked by Morningstar Inc., and recognized by Kiplinger’s Personal Finance magazine for its low fees and industry innovations such as its customized allocation investment options. A Morningstar Analyst Rating™ for a 529 college savings plan is not a credit or risk rating. Analyst ratings are subjective in nature and should not be used as the sole basis for investment decisions. Morningstar does not represent its analyst ratings to be guarantees. Please visit Morningstar.com for more information about the analyst ratings, as well as other Morningstar ratings and fund ratings.